Most full-time bass pros who run a Bullet boat use the 21XRS, which is 10 inches longer than the 21-foot-long 21SST I tested, but if speed is the top priority, the 21SST is the Bullet to get. 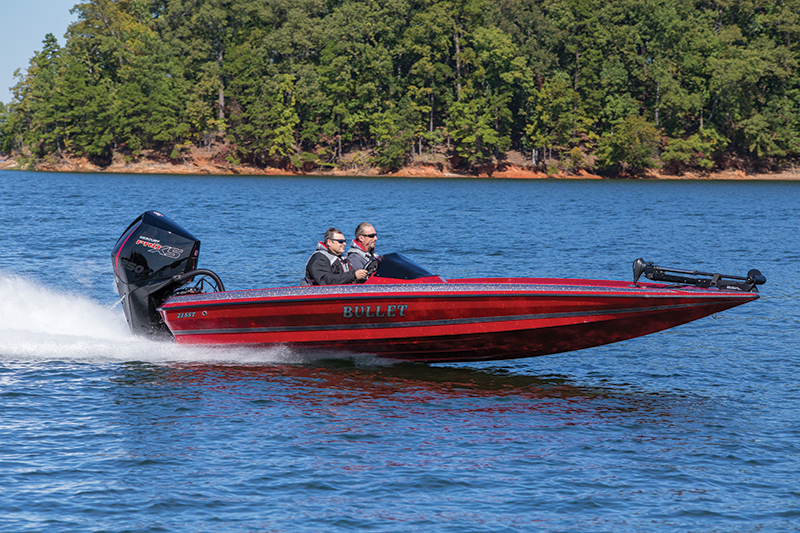 I got a sneak peek at the Bullet 21SST at Mercury’s legendary Lake X, and with a 300R V-8 engine it reached a hat-peeling 103 mph. 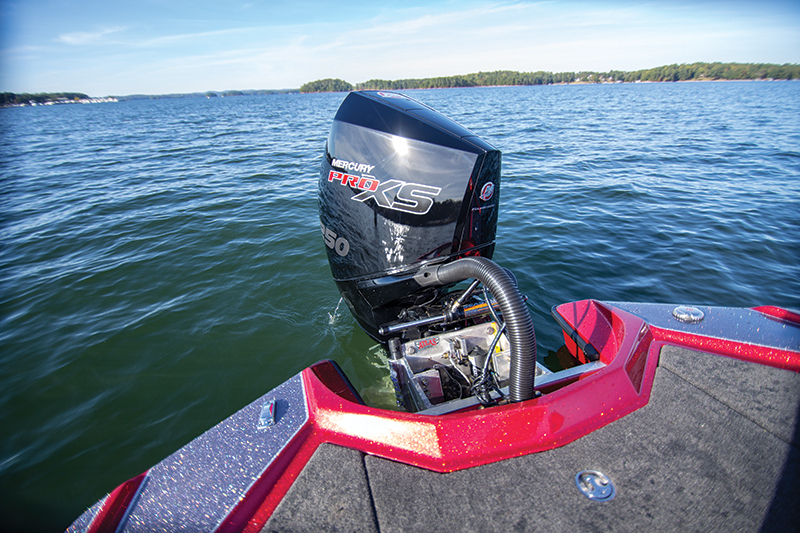 The boat I tested on Lake Lanier, near Atlanta, was the same but had a different member of Mercury’s 4.6L V-8 family: the ProXS 250. The first hint to the Merc’s performance potential is its gruff growl on startup, the product of having one muffler rather than the standard two. And the ProXS 250 is no sheep in wolf’s clothing, as it pushed the 21SST to 84.4 mph. When I stomped the standard Hot Foot pedal, there was a fair amount of bowrise and it took a couple of seconds to hook up properly, but when it did it was like Mr. Toad’s Wild Ride. On plane in 3.6 seconds, it started to porpoise a little, but I just drove through it and the boat settled down in earnest and the needle started climbing fast. Bullet not only makes sure its owners are the first to the fishing grounds but also gives anglers pro-level amenities such as a 40-gallon divided livewell that has a pumpout. 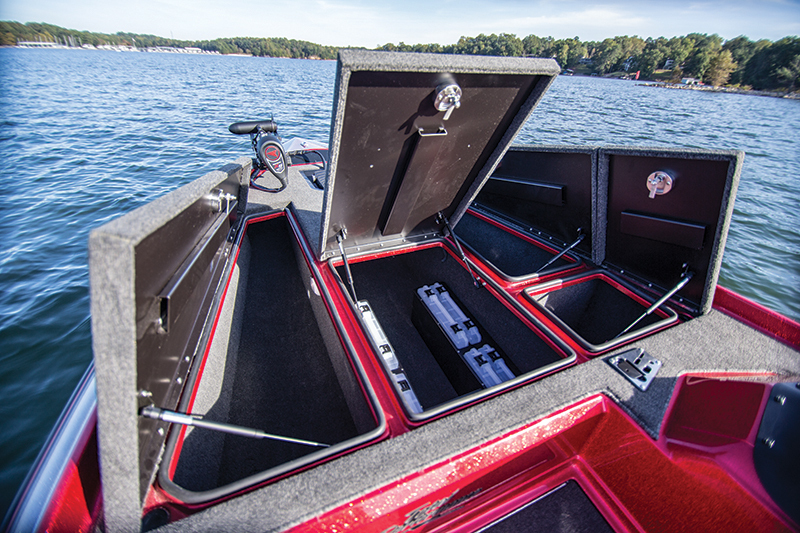 At the bow is plenty of room for an arsenal of rods in port and centerline storage compartments. The starboard box holds tackle boxes or life jackets, and a smaller day box is just in front of the helm. There’s no passenger console, so there’s room for two small storage compartments that can be used as step-ups to the front deck; one can be used as a cooler. The signature skinny Bullet bow section limits the real estate up front, but three anglers can fish the 21SST in comfort. Twin spring-assisted SAS passenger seats are extra wide and provide a high degree of comfort, and the center “brother-in-law” seat is the lid for the cooler. 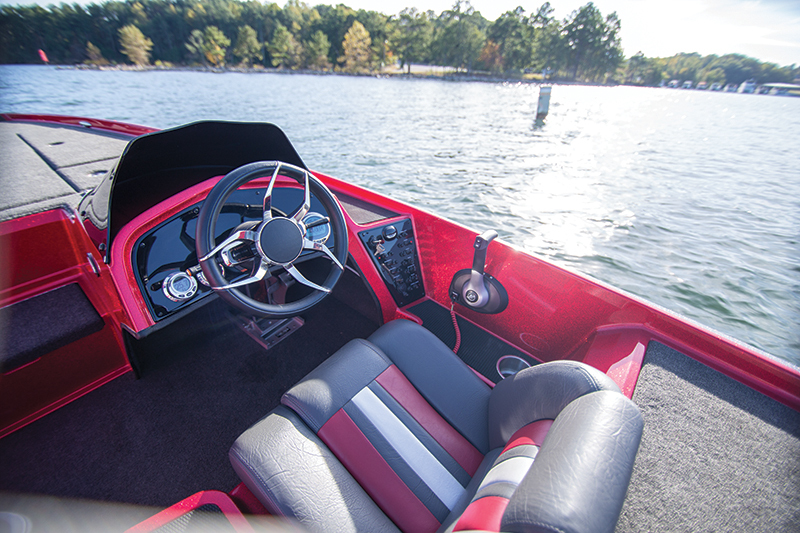 The driver’s console is a low-profile model that necessitates the use of a Boatlogics bracket mounting system ($100) for displays up to 12 inches. 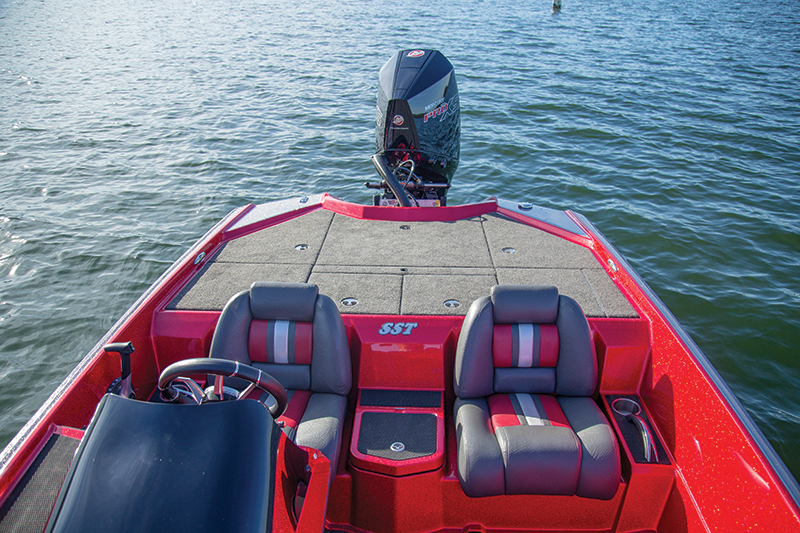 At a relatively narrow 7 feet, 7 inches wide, the Kevlar-reinforced hull weighs only 1,300 pounds, which helps it get good fuel economy and attain its high speeds. And with 22 degrees of deadrise, it has a smoother ride in the chop than most bass boats. Beam: 7 ft., 7 in. Dry Weight: (HULL ONLY) 1,300 lbs. Time to Plane: 3.6 sec. Time to 30 mph: 7.0 sec.